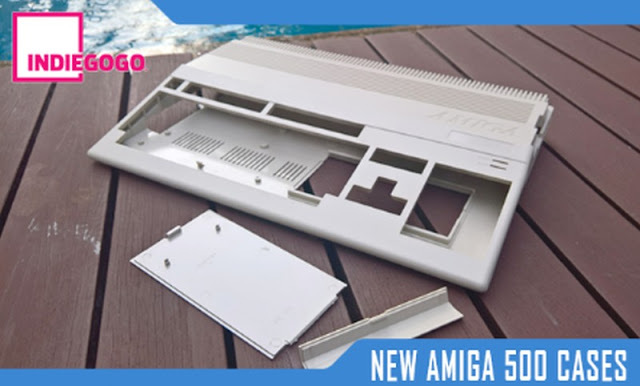 If you've been following Indie Retro News throughout the last few years you would've by now received a lovely new Amiga 1200 case in your hands all glistening in a colour of your choice, which shows how reliable the team behind the Kickstarter was at getting the products to your door. Fast forward to this year however and the same team as A1200.net are hoping the Amiga 500(+) case crowd funding campaign to be equally successful, but at 96% of a $155,000 goal and just half a day to go, they need all the help they can get to hit that goal. As we said before if you've felt a little left out with the previous campaign or don't have an Amiga 1200, then now maybe your only chance to bring that Amiga 500 out of its yellow shell with eye candy colours or as it just came out of the show room to show off to all your friends. Still if a colour change with Anti-UV isn't the only thing on your mind, there's also new screw threads, Apollo Boards Friendly Design Ready for the Vampire V4 Standalone & Raspberry Pi 3, Dedicated ports extender, legendary signatures and much much more!